Status: offline Pnt states "feels like something is in there". What are the findings? Status: offline Thats pretty funny! Status: offline Too easy Alex, of course this is a case of SAS: sub acromial santa! Status: offline Good one Alex! Happy Holidays! Status: offline Is that a SLAP lesion? Santa's LAP? Status: offline Someone needs to get this patient into surgery and have a Santa-otomy done pronto! What am I going to tell my kids on Sunday??? Santa's stuck in a soldier's shoulder? Status: offline SJ--repeat your last sentence really fast 5 times! I assume Santa got outta there cuz he was pretty good to my family this year. I was too busy to wish everyone a merry christmas, but here is to a happy and healthy 2006. 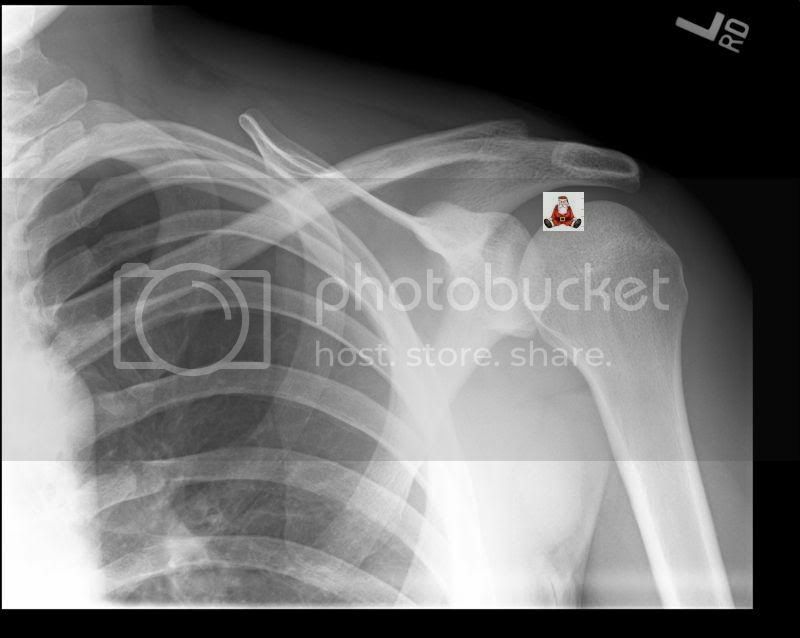 Status: offline This x-ray looks normal to me! Status: offline Does the pain disappear after Christmas? Follow up x-rays maybe needed I think. Status: offline Thanks for not showing us where the reindeer are.